OnLAB is the Lab Management tool from Online LIMS specifically designed for geochemical or environmental production labs. A powerful and unique feature of OnLAB is the ability to handle both routine and batch jobs simultaneously, giving the user unprecedented flexibility. Routine jobs allow samples to be logged and track effortlessly, while a batch job can accommodate even the most demanding analysis request from lab clients. OnLAB is very efficient and user friendly. 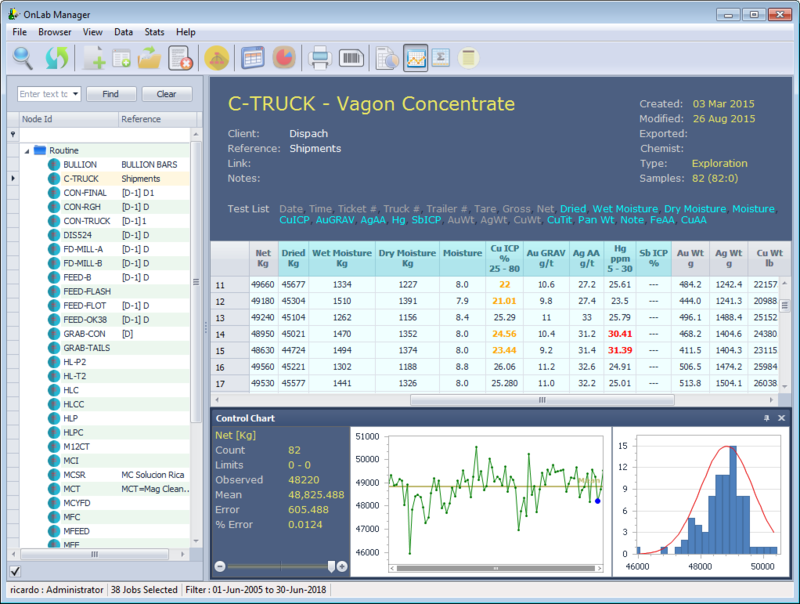 It is characterized by a unique job browser interface and analytical reports are presented in a familiar spreadsheet format similar to MS Excel. OnLAB provides important real-time information such as the lab’s current workload status as well as other statistical and financial information needed by lab managers and supervisors. OnLAB offers a flexible and intuitive job browser that allows viewing and grouping jobs in hierarchical order, by job status or views with more of less details. Powerful filters allow users to perform quick searches for any job data and to get a good understanding of the overall lab’s workload. Each job is color code according to it status, pending (red), ready (green), giving the user a quick and easy overview of the labs progress. Sample login is efficiently handle through the use of templates and when OnLAB is used in combination with a external tool samples can be login directly by the lab clients. Electronic reporting is an important part of OnLAB. Interfaces can be configured to automatically export published results to either external system like Production Process Databases, ERP or produce electronic files of different formats including Excel, Pdf, etc. Certificate of Analysis and labels are designed to work with customizable print formats that are easily maintained by the lab staff. Using OnLAB’s out of the box statistics and charts managers can easily produce monthly reports of different aspects of the lab progress including costing reports and client summaries. OnLAB’s built in sample tracking automatically track samples as they move through the lab, giving managers and lab clients and real time information on sample progress and location. 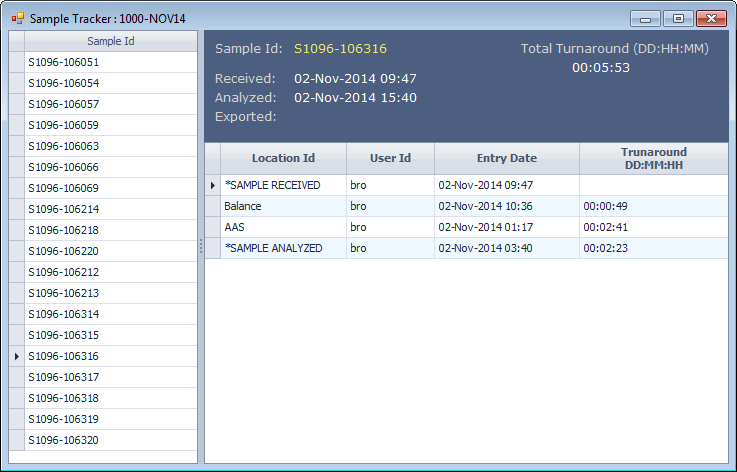 Sample tracking information includes received and published dates, turnaround time between each lab stage and as well as user custody. For more detail tracking OnLAB supports the use of barcode scanning. OnLab extensive auditing includes a complete list of changes for each assay result from the moment the assay is first recorded until the result is published. The log is time stamped with the date and time when change was made together with the user name responsible for the change. Additionally to this log, OnLAB users also have access to each result’s data source, which includes details of any calculation and instrument data. This detail auditing give lab managers unprecedented confidence and assurance knowing exactly how each assay result was derived. OnLab’s quality control can quickly detect out of range values and display them in a color coded format allowing the lab manager to quickly identify any issues and take corrective action. 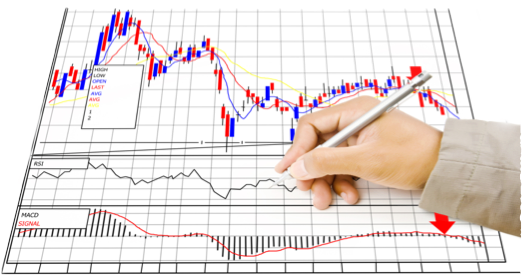 Quality control charts can be viewed as historical trends or in a comparative mode between various dataset. A software technology company focused on laboratory automation and instrument integration tools. With 25 years in the market and a unique and comprehensive background, we offer our customers the best services and results. 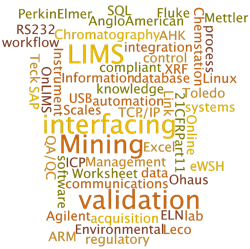 Online LIMS - Instrument Interfacing and integration for your LIMS. © Online LIMS, All Rights Reserved.